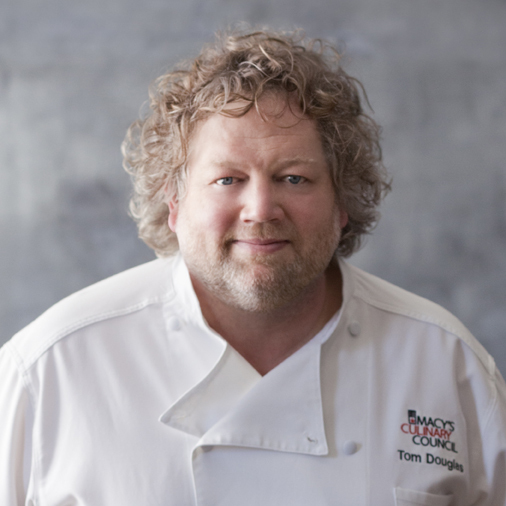 Tom Douglas has already had a full house for Thanksgiving this year. 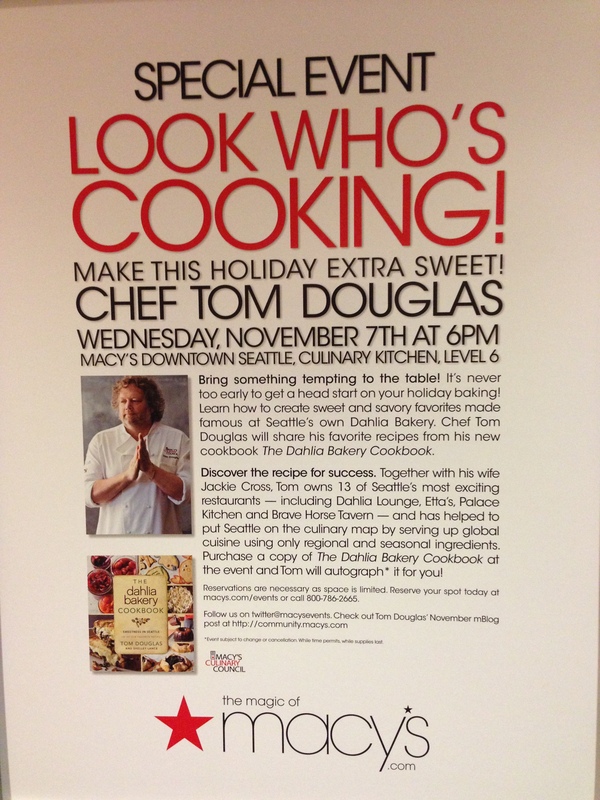 Two weeks shy of Thanksgiving Eve on Nov 7th, Tom drew an eager and hungry crowd to Macy’s Downtown Seattle store Culinary Kitchen on Level 6, awash in gleaming cook and tableware on holiday display. The much anticipated guest, Tom Douglas, has been a member of the host Culinary Council for 6 years, traveling around the country for Macy’s Culinary Council (MCC) events, comprised of some of the nation’s leading culinary masters, including Ming Tsai, Todd English, Emeril Lagassi, Wolfgang Puck, and Cat Cora among others. For his ‘Bring Something Tempting to the Table’ live demo, Tom, his staff, and MCC’s Executive Chef, prepared and sampled a selection of sweet and savory Thanksgiving dishes from his newly released Dahlia Bakery Cookbook. He opened his talk with tales of his book tour, which landed him in NYC last week -posing a bit of challenge -coinciding with Super Storm Sandy’s imminent landfall. He recounted the treacherous transportation options and the city’s desperation to circumvent them, and of paying $300 for a taxi ride out of the city, after two earlier cab drivers refused similar inflated offers. Isn’t the honor of squiring this celebrated chef payment enough? Recalling for me the NYC culinary publications like Bon Appetit posting pictures and recipes for fall comfort foods during the storm, Tom shared his recipe and warmed mini bites of his Grilled Cheese and Caramelized Broccoli Rabe and Fontina that had the audience cozily melting in contentment. Always the educator, Tom offered a prize to anyone in the audience who could tell him the Chinese form of broccoli – (it’s Kai-l) and treated the winner to a measuring cup full of a favorite libation. 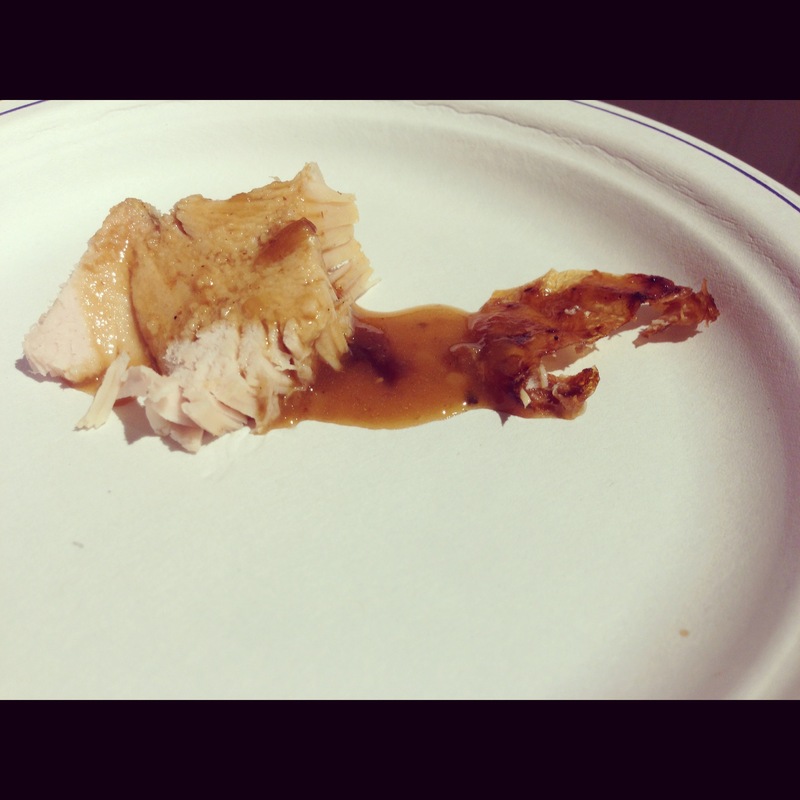 Imparting a true Northwest flavor and local industry tie-in, aromatics from Starbucks’s Thanksgiving blend – a dark roast which Tom helped develop –featured prominently in his main dish –the ‘Coffee-Bean Turkey with Sweet Onion Gravy.’ With a ½ cup sprinkled throughout the bird cavity while cooking, any stray beans are removed from the roasting pan before making the gravy, or roux, from the drippings. Another local favorite,Washington wine, appears in his roux, and he recommends Columbia Crest’s 2010 Pinot Gris and uses it in his Culinary Council traveling chef tours, noting that Wine Spectator lists it among ‘Best Wines Under $10 in the World.’ The bite of turkey, deliciously tender with its bottom brushing of rendered bacon fat, and buttering under the skin, was equally balanced with the dark, smoky flavor of the dark roast coffee beans, a perfect complement to the richness and sweetness of the roux’s butter, onion, and wine. And what is Thanksgiving without dessert? Tom Douglas Co’s pastry chef, Stacy Fortner, who under his tutelage, perfected her artistry and now runs the show at Serious Biscuit –helped develop the evening’s sweet finish- ‘Pear Tarts with Dreamy Caramel Sauce.’ Made with a 1,000 layer puff pastry sheet, which his restaurant buys from a supplier from frozen, the complex dessert featured ripe, firm pears poached in water, sugar, and vanilla beans Tom demonstrated scooping out of the pod with a knife edge. He then demonstrated the making of the caramel sauce, with sugar, water, heavy cream, and unsalted butter at a high temperature until it turns a deep amber and joked that you can tell it’s ready by placing your finger in it. (Not recommended). Once the liquid darkens, you immediately add the cream, and stand back, as it causes the sauce to sputter. Safety first, Tom cautions. His pastry chef also advised using the highest sided pan for this recipe –burns apparently have taught these chefs many a lesson. 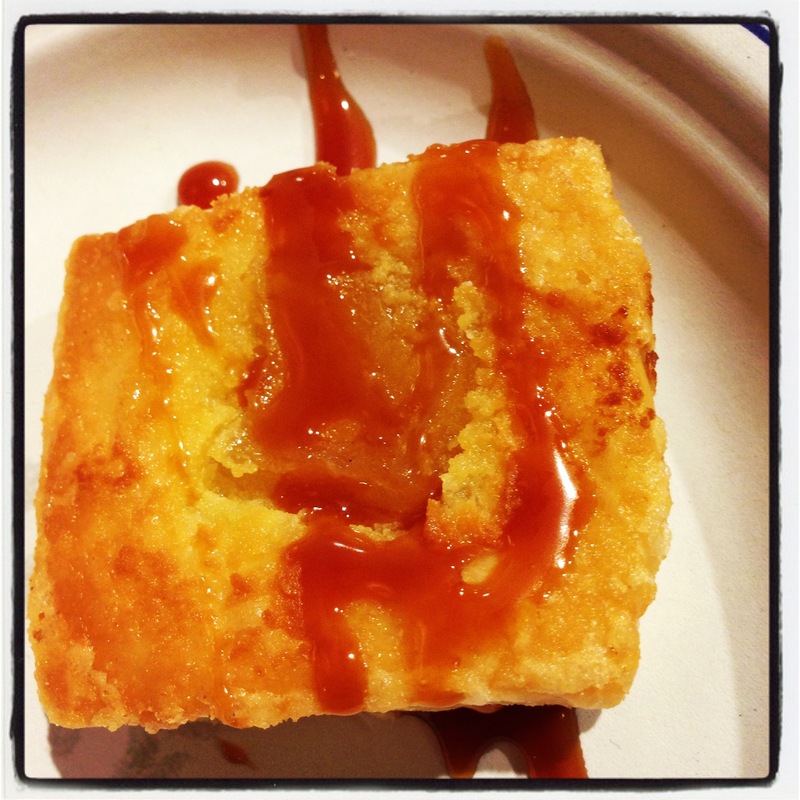 Topping the tarts were a drizzle of the Dreamy Caramel Sauce and a garnish of a fresh sweetened almond cream – a splendid combination of buttery and sweet richness. With Tom’s cooking antics on display -his dishes a delight –the 2 hours flew by -cameras flashing and seatmates chatting while they passed the coveted samples down the line before gobbling their own. His charmed and sated guests lined up afterward to have their purchased copies of his cookbook signed by the head chef and raconteur himself, cementing this experience to look back on fondly while preparing his recipes in their own home. Tom Douglas, Chef and Entertainer, tempted and tantalized this lively Thanksgiving table and can do the same for yours. Disclosure: I was contacted by Everywhere on behalf of their client, for coverage of this event in exchange for goods, services, or payment for my participation. Like Everywhere, I abide by FTC guidelines in disclosing this information. Tonight -Tom Talks Turkey (Day) and Tempting Treats ! Know what makes the end of presidential campaigns even sweeter –something warm out of the oven by a celebrated local chef who is living out some ambitious forward-thinking goals for bettering the health and sustainability of our community. Sound familiar? How about getting a piece of that progressive pie tonight? 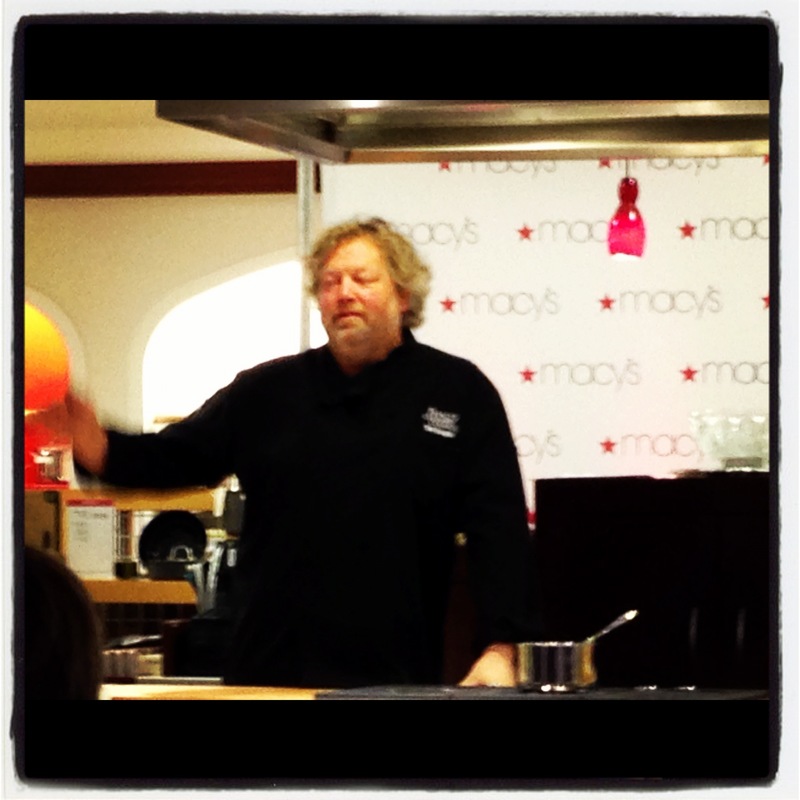 In case those election night pre-jitters are still coursing through your body, (not to mention the streams of discourse all over Facebook and Twitter), I invite you to join me tonight at 6 p.m. at the Macy’s Downtown Seattle for their Culinary Council event with Chef Tom Douglas. 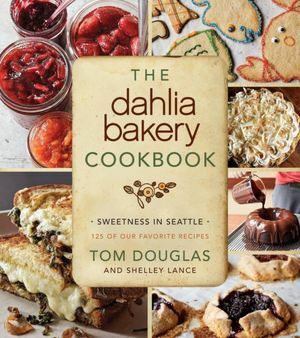 Pick up a copy of his latest book –The Dahlia Bakery Cookbook and get it autographed by Tom himself! Dahlia Lounge diners and visitors to its adjoining Dahlia Bakery can attest to the sweet finishes Douglas’ bakery team whips up for your culinary enjoyment in-restaurant or at home. And not that you need reminding, but the ‘Biggest Eating Event of The Year’ is coming up in oh, 2 weeks from tomorrow -no panic inducing intended. Why not pick up some tips from a guy who has some tricks up his chef whites’ sleeve? too early to get a head start on your holiday baking! cookbook The Dahlia Bakery Cookbook. If his testament of hard work, dedication, and learning and moving forward from mistakes isn’t enough to get you through the door tonight at the 6th floor Culinary Kitchen, the wafting smells on the elevator ride up should do it. See you there tonight! Capacity for tonight’s event is limited. RSVP here or call 800-786-2665 to claim your spot. Cheese connoisseur I am not. That distinction I tend to reserve for my penchant for crepes -which often have cheese in them, but my tastes lean more towards sweet. I do have my favorites. Goat. Mozzarella. Gruyere. Parmigiano-Reggiano. Brie. Cheddar. Apparently when it comes to cheese I like to play it safe. If it stinks, has veins or dwells in a cave, I’ll probably pass. But I did get an earthy mouthful of insanely good cheese along with an earful of Cheese 101 on Wednesday evening thanks to the folks at Murray’s Cheese. They’ve recently set up shop at the University Village QFC. I attended a blogger’s preview on Wednesday to tour the NYC-based Cheese Shop’s first Seattle location and took part in a wine and cheese pairing session led by Liz Thorpe. Easily considered the foremost -if not youngest -expert in her field, Liz is Murray’s VP, author of The Cheese Chronicles and co-author of The Murray’s Cheese Handbook. In researching her book, Liz spent 7 years closely interacting with local cheese makers from everywhere, learning the ins and out of cheese, while “crisscrossing the country to taste, talk, study, and celebrate it in all its milky guises” and as she candidly admits, “eating a lot of awful cheese.” Talk about suffering for your craft. Since coming aboard as VP, “she has been hugely influential in bringing American cheese making to the forefront, as well as greatly expanding the company’s wholesale program,” said Nathan Alridge, Field Merchandising Specialist, also on hand to lead the wine and cheese pairing. Both were extremely approachable and offered witty and interesting anecdotes along our cheese tasting journey, explaining each pairing in passionate detail and specifying each cheese’s family – or category – for neophytes like me. Ask anyone from the East Coast and they’ll likely know of the Greenwich Village institution. Humbly founded in 1940, it now boasts two flagship stores – one on the original Bleecker Street – a thriving wholesale business, and more recently, outposts in Kroger’s supermarkets and their subsidiaries in select cities (like QFC’s around here). What does that imply for our local cheesemakers? It means a renewed focus on the craft of cheese making. 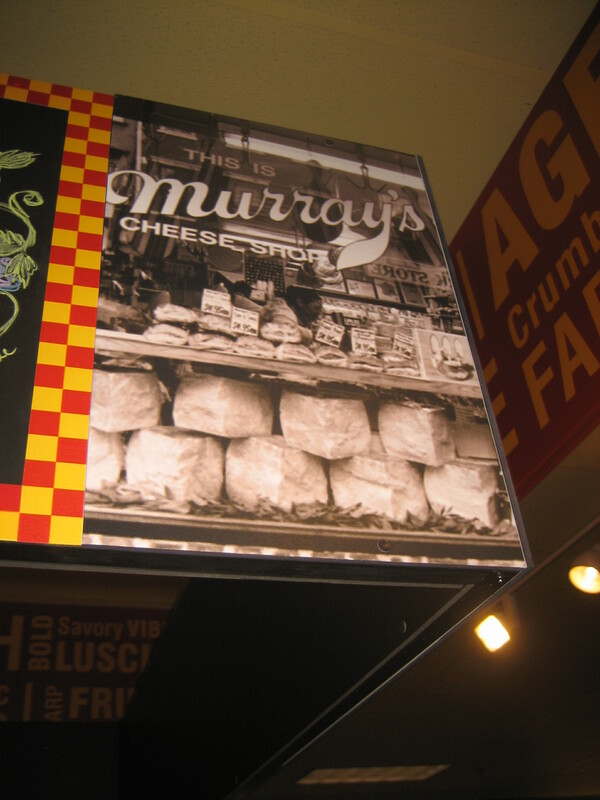 Murray’s is dedicated to bringing domestic cheeses to the forefront of shopping lists by highlighting and educating consumers on the American style of cheese-making and will be showcasing cheesemakers from Washington and Oregon. In the coming months Murray’s will be hosting ‘Meet Your Local Cheesemaker‘ events with Beechers, Cascadia Creamery and Mt. Townsend. A great way to put potential customers in touch with local cheese-makers and “in taste” with local cheeses. 1st – La Tur –A pasteurized cow, sheep, and goat –which Liz deemed a ‘Brie 201,’ for its heavier, richer cheesecakey texture than the runnier brie most of us are used to. It comes from Piedmont region of Italy, and has a bloomy rind. Served drizzled with Oregon Grower’ Wildflower Honey and a Domaine St. Michelle Brut, the Murray’s folks called this an overall favorite of its preview reception. With its richness and mouthfeel, and the concentrated sweetness of the honey -I’d have to agree it was my favorite as well. 2nd – Tumalo Farms Pondhopper – A pasteurized goat cheese from Bend, OR, and a specialty semi-hard cheese with a hint of Cascade Hops from a local microbrewery. This one was served with Thistly Cross Cider. Liz shared that the owner of Tumalo Farms is also the co-founder of WebMD, and she had no qualms about this cheese purveyor running out of operating funds any time soon. 3rd – Pont L ‘Eveque – A pasteurized cow cheese, from Normandy, France – that once formed into a wheel -is washed in salt water, several times a week for 8 weeks to impart its signature taste to the rind. Traditionally, beer was added to the washwater brine, as cheese was often made by 12th century monks, who we know also brewed their own beer. Murrays writes that ‘this Norman treat has been restoring ruddy face, sweater laden Frenchies since the 12thcentury –slicing the plump,stinky tile onto dark bread and nosh with a cup of cider or well-worn flask of Calvados.’ Here it was served with Thistly Cross Cider –for a perfectly balanced pairing to the brine. 4th – Manchego – A pasteurized sheep cheese–from Castilla-La Mancha, Spain – it’s a specialty cheese. It’s aged 9-12 months, lending it a more granular, dry texture with a nutty, caramel flavor. A year’s aging process also results in sharper acidic notes –as its flavors are more concentrated. A younger Manchego, by contrast, is only aged 3-4 months and is more pliable, and doesn’t have as sharp an acidity or concentrated a flavor. The classical pairing is a quince paste, but to give it a more NW flavor, they served it with a Oregon Grower’ Pear Hazelnut Fig Pate, and a Red Diamond (OR) Malbec. This was probably my second favorite pairing –but then again, I’m partial to both manchego and Malbec. What can I say –I was born in Spain & have the palette to prove it. 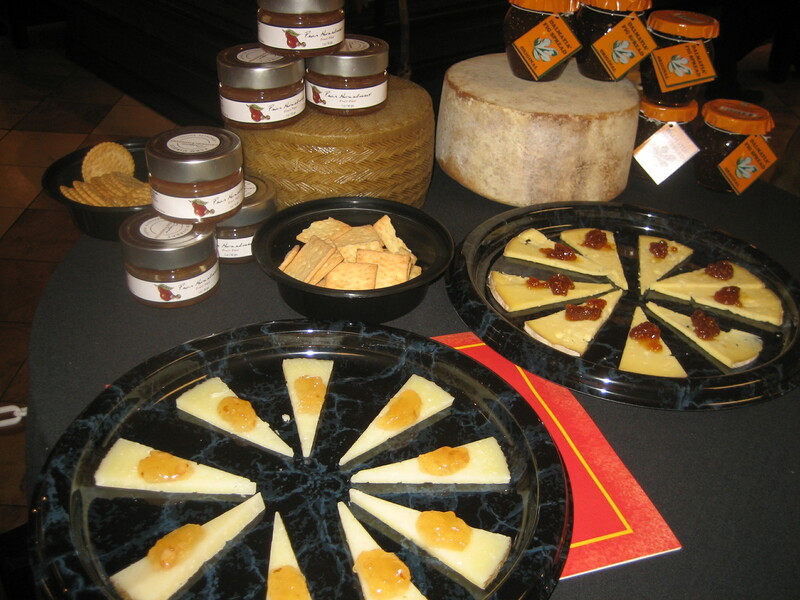 5th – Cascadia Creamery Sleeping Beauty – a Raw Cow cheese, from Trout Lake, WA, a specialty cheese with a natural rind. The size & shape of wheel is comparable to Manchego. Cascadia Creamery Cows are grass fed – and the cheese color will appear more orange based on the stage of grass growing season (due to the beta carotene content). Depending on when you shop for it, you could get a very yellow cheese that appears to be artificially enhanced. It was paired with the Dalmatia Fig Jam, which is one of Top 3 cheese pairing products sold at QFC, and is made with imported Adriatic figs. The wine poured was an Erath Pinor Noir. 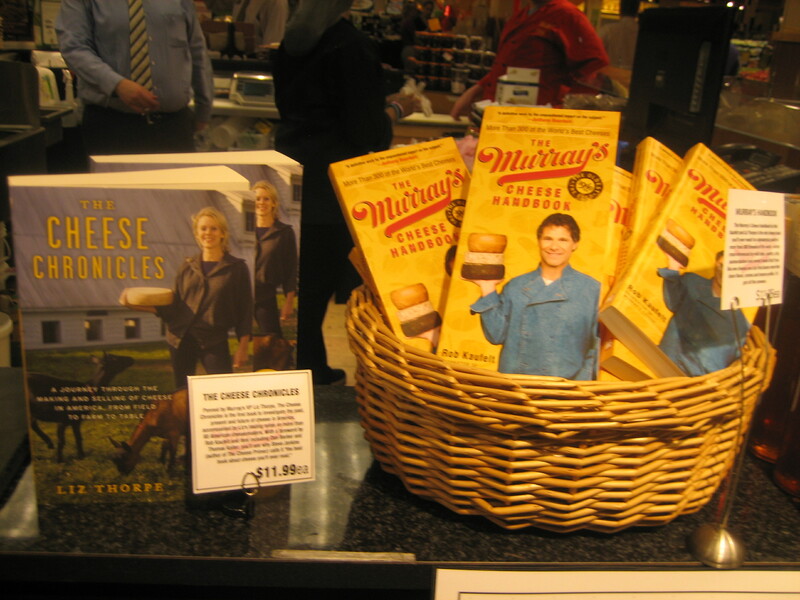 Murray’s public opening was Thursday night from 4-7 p.m. at the University Village QFC. They’ll open in two more QFC stores this spring –both on Capitol Hill; Harvard Market in April and Broadway Market in June. The University Village location is the first of seven cheese shops scheduled to open inside Seattle area QFC stores this year, so keep your eye out for one opening near you. Also watch for the ‘Meet Your Local Cheesemaker’ in-store events, which will happen every Saturday from 10 am -4 pm during the grand opening month of each store, and will feature such notable locals as Kurt Beech Dammeir and Brad Sinko of Beecher’s Handmade Cheese, Tom Schuman of Cascadia Creamery (Trout Lake), and Matt Day of Mt. Townsend Creamery (Pt. Townsend) -all from WA state. I want to thank Murray’s Cheese, for the wonderful education and cheeses for which they are known, Chateau Ste. Michelle for the delicious wine pairings, and QFC for being such gracious and generous hosts. I will be sure to venture into more unexplored cheese territory -and who knows, venture deep down into the Murray’s Cheese caves or ‘subterranean aging rooms’ on their popular tours -next time I’m in ‘The Village’ -Greenwich, that is. 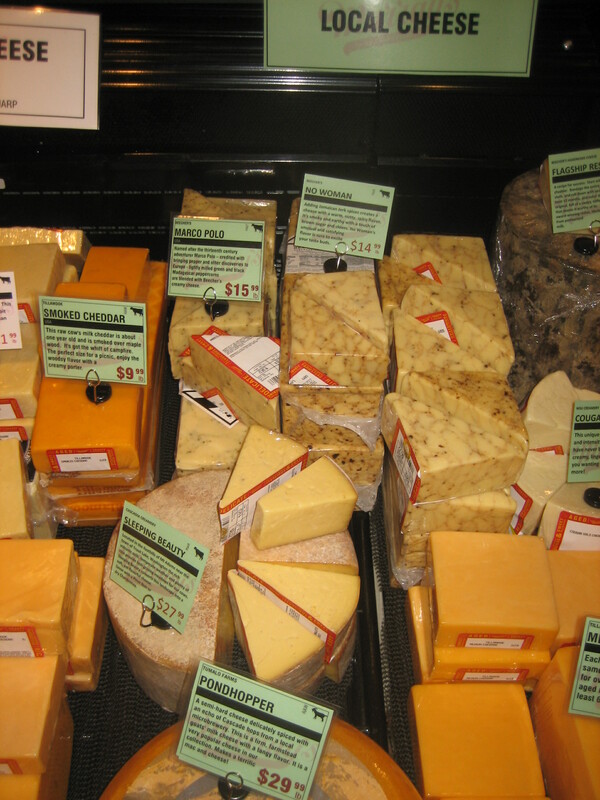 But maybe I’ll swing by my local ‘village’ QFC to pick up some of that stinky cheese first. Today’s the day to seize the cheese! 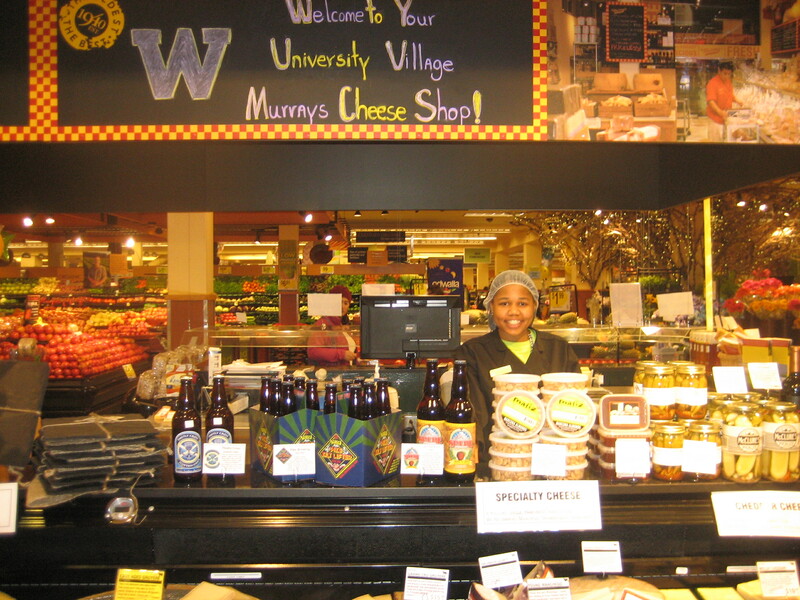 Murray’s Cheese Grand Opening at QFC U Village 4-7 p.m. I joined several local bloggers there last night sampling several of their best selections paired with Chateau Ste. Michelle Winery wines and spreads, pastes, local honey! I’ve never gorged so much on cheese in one sitting! 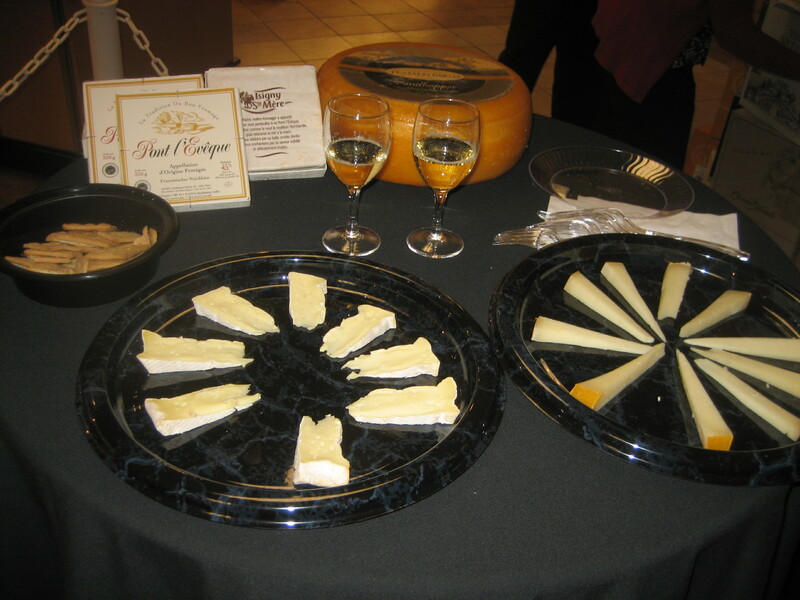 We tasted La Tur, Tumalo Farms Pondhopper, Pont L ‘Eveque, Aged Manchego, Cascadia Creamery Sleeping Beauty. Come on down tonight and try these amazing aged beauties for yourself. If you haven’t seen the spot in Seattle Magazine yet, it’ll at least tide you over until I post about the greatness that was Murray’s Cheese Grand Opening. Ha -just saw this LivingSocial Adventure for ‘Vino and Vinyasa’ at Columbia Winery which found me reliving my semi nauseous hot yoga sesh yesterday (thanks for the studio recommendation, Harmony) after having vino with a late lunch a few hours prior. Thankfully, I’m a Bikram vet, and I knew it would subside quickly, but in the meantime, must abstain from vino before class until I build up my (stomach’s) endurance -if not that then for the dreaded Awkward (Chair) Pose. I continue to be impressed by Hogue Cellars Wine Genesis 2008 Syrah (which seems to be in somewhat short supply?) It caught my eye on a Fred Meyer run a few days ago. This vintage offers ‘aromas of grape, bramble and strawberry, offset by a minty-floral character. Upfront flavors of black cherry, strawberry and nectarine are backed by earthy oregano and cumin. It’s supple and spicy on the finish.’ I was drawn in by the oregano and cumin bit – it’s a really tasty & smooth Syrah – I highly recommend it. Read more about Genesis from Hogue Cellars‘ website. Picked up my ticket to Taste Washington (for Sat) over the weekend at Wine World (saved $11 in online fees) -en route home from a Whidbey farm -brought the ‘barnyard’ into Wine World via rain pants & muddy rubber boots. First time at this event & I’m hearing it’s heavily recommended that you should plan to spit aplenty at this one & save the full swigs for ones you really like. I’m gonna draft a game plan -per Northwest Wine Anthem‘s recent piece-some great info here. What are your own strategies for taking on this epic event? I’ve got sheep on the brain -going to check out a flock of bahhhhby lambs on beautiful Whidbey Island Farm Camelot Downs tomorrow with the PCC Farmland Trust along with Lisa Beuning. I just checked out this video about Camelot Downs and what it means to be a ‘Colonial Farm.’ Apparently, that means no running electricity, and that lamb birthing is done by lamp light –wow, that’s impressive. Looking forward to learning more about the Colonial Farm experience tomorrow -weather gods, please be kind. CAMELOT DOWNS: colonial sheep from Mark Plumberg on Vimeo. 5 minute video for ASI am petition on behalf of Gary and Lois Fisher at Camelot Downs on Whidbey Island. A truly unique colonial farm. This only touches on the unique aspects of the farm and the sheep. Stay tuned for the full length video on the entire colonial farm experience. Glad I made it to YPIN‘s Happy Hour at Black Bottle last night – I heard about a new Food Review app: Fondu – from one of its local ambassadors. It combines Yelp, Twitter and Foursquare -and it’s new to me -apparently it hasn’t quite made the rounds in the Seattle food blogging scene, but there are plans for some community events in the near future. I’m gonna check it out -it’s free in the App store -sorry Android Market customers -hopefully your time will come soon. What about you? Do you Fondu? Check out Tech Crunch’s take on the bite-sized social network. Hey coffee and waffle lovers, come join me on Sunday for Seattle Coffee Works Grand Opening at their new Ballard cafe on Market St (former Tully’s site). I know and love the folks behind SCW well -they were even featured on Andrew Zimmerman’s Bizzare Foods not too long ago & they’re home to the Obama coffee blend. I’m a huge fan of their coffee & great brand of service & a smile. 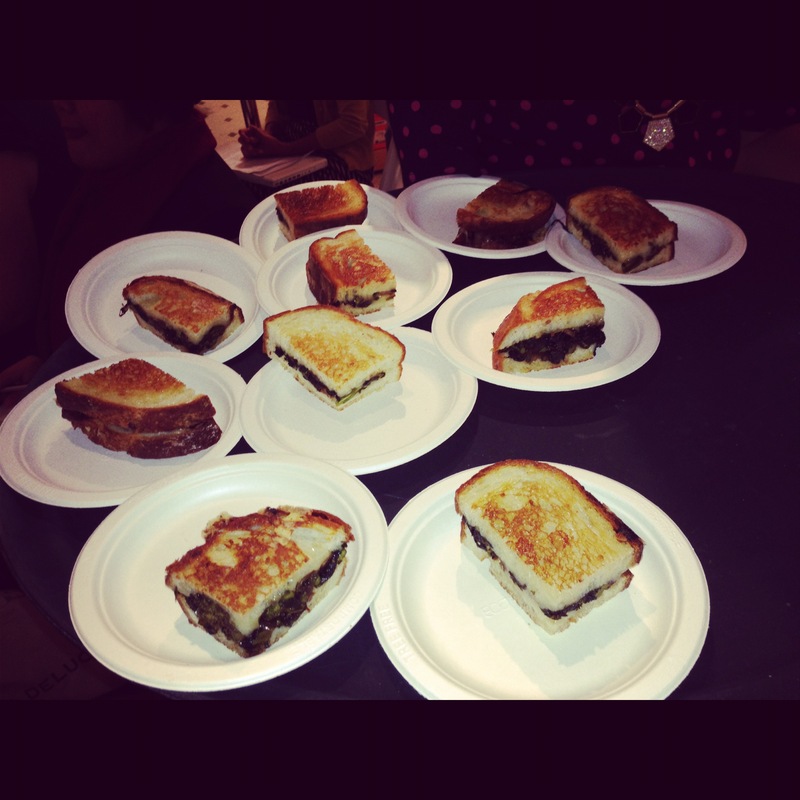 Check it out their spot in Seattle Eater.